All living things on the Earth store their genetic information in long strands of DNA. These strands of DNA are delicate, and may be damaged in many ways, so all cells face the same problem: how to protect their DNA and repair it if gets damaged. Breaks of the entire double helix, breaking both strands at once, are the most dangerous problems that happen to DNA, and most cells have two elaborate repair mechanisms to correct them. Double-strand breaks are more common than you might imagine: they can be caused by outside dangers such as radiation or chemicals, but they also happen by accident during the normal processes of replication and recombination. Of course, if they are left unfixed, they are disastrous, destroying genes and corrupting the integrity of chromosomes. Mre11 is at the heart of one of the major processes that fixes double-strand breaks in DNA. This method is called homologous recombination, because it relies on having at least two similar copies of the genome in the cell. It uses one copy of the genome as a template to reconstruct the broken copy. Because it uses an intact DNA to guide the repair, it is very accurate. Mre11 finds the broken ends of the DNA and gets this whole process started. Mre11, shown here from PDB entries 2q8u and 3dsc, is a composed of two identical subunits, which associate to form a complex with a groove down the center. The two arms of the complex (extending to right and left here) bind to DNA, positioning the broken DNA strands (the short pieces of DNA used for the structure analysis are shown in red and yellow). Then, the nuclease domains in the center of the protein trim the ends of the DNA and make them ready for repair. Mre11 acts as part of a larger complex of proteins, including the long protein Rad50 that forms a tether between the broken strands and the rest of the chromosomes. 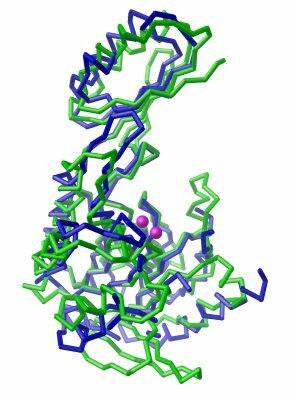 Researchers at JCSG have solved the structure of Mre11 from the eubacterium Thermatoga maritima, as part of their large structural genomics effort to determine the structure of all proteins from this organism. The structure was instrumental in determining the function of the protein. It was postulated to be a nuclease based on its sequence, but its identification as Mre11 nuclease was only made after the structure was solved, since its sequence is quite different from the sequences of Mre11 nucleases from organisms in other kingdoms. Comparison of the Thermatoga enzyme with the one from the archaeon Pyrococcus furiosus showed that they have similar domain structures and active sites, but differences in their fine structures may cause them to interact differently with particular types of damaged DNA. By comparing these two structures, researchers will be able to pinpoint the structural features that are important for DNA recognition and interaction of Mre11 with its partners in homologous recombination. Use the interactive Jmol to compare the two structures. You can flip between two structures of Mre11 nuclease using the buttons below. 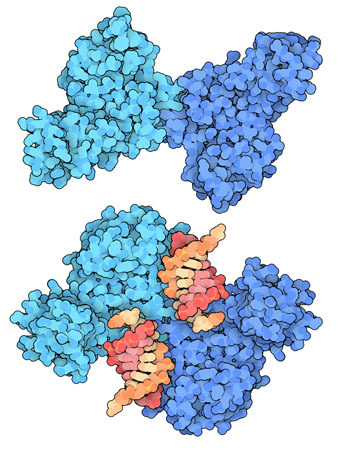 The Thermatoga structure includes only the protein, which is composed of two domains--the nuclease domain colored light blue and the DNA-binding domain colored light green. The Pyrococcus structure has two metal ions (magenta) and a nucleotide (yellow) bound in the active site. The active site includes a histidine (red) that is important in the nuclease reaction, and several other amino acids (in pink) that coordinate the metal ions. Notice how the binding of metal in the Pyrococcus structure tightens up the active site and positions the catalytic histidine close to the substrate. Das, D., Moiani, D., Axelrod, H. L., Miller, M. D., McMullan, D., Jin, K. K., Abdubek, P., Astakhova, T., Burra, P., Carlton, D., Chiu, H.-J., Clayton, T., Deller, M. C., Duan, L., Ernst, D., Feuerhelm, J., Grant, J. C., Grzechnik, A., Grzechnik, S. K., Han, G. W., Jaroszewski, L., Klock, H. E., Knuth, M. W., Kozbial, P., Krishna, S. S., Kumar, A., Marciano, D., Morse, A. T., Nigoghossian, E., Okach, L., Paulsen, J., Reyes, R., Rife, C. L., Sefcovic, N., Tien, H. J., Trame, C.B., van den Bedem, H., Weekes, D., Xu, Q., Hodgeson, K. O., Wooley, J., Elsliger, M.-A., Deacon, A. M., Godzik, A., Lesley, S. A., Tainer, J. A. and Wilson, I. A. (2010) Crystal structure of the first eubacterial Mre11 nuclease reveals novel features that may discriminate substrates during DNA repair. J. Mol. Biol. in press. Williams, R. S., Moncalian, G., Williams, J. S., Yamada, Y., Limbo, O., Shin, D. S., Groocock, L. M., Cahill, D., Hitomi, C., Guenther, G., Moiani, D., Carney, J. P., Russell, P. and Tainer, J. A. (2008) Mre11 dimers coordinate DNA end bridging and nuclease processing in double-strand-break repair. Cell 135, 97-109. Williams, R. S., Williams, J. S. and Tainer, J. A. (2007) Mre11-Rad50-Nbs1 is a keystone complex connecting DNA repair machinery, double-strand break signaling, and the chromatin template. Biochem. Cell Biol. 85, 509-520.